She came, she saw and she conquered, perhaps would be an apt description for Jayaben Desai, the face of Grunwick strike, who never took things lying down. A short Gujarati woman, Jayaben stood tall by taking on the mighty Grunwick employers for the injustice meted out to the factory workers. In August 1976 six Gujarati women walked out of the Grunswick photo processing factory in Willesden, North London. Led by Jayaben, their grievances included low pay, poor working conditions and the owner’s refusal to allow union recognition. 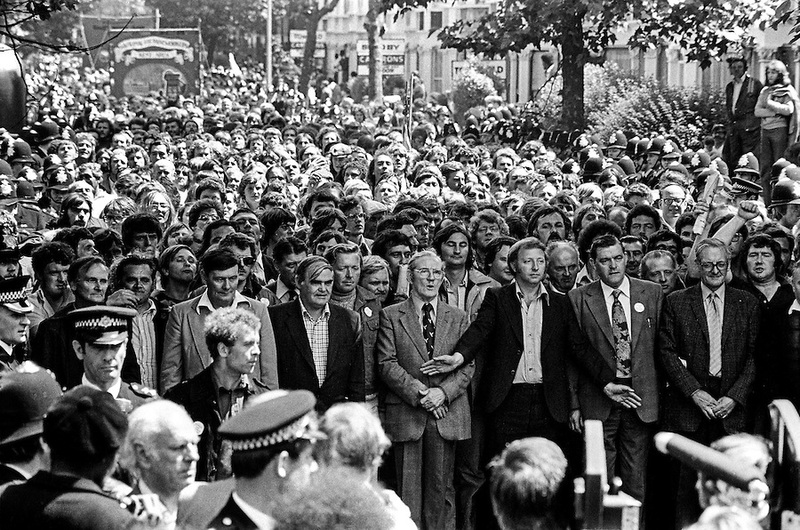 The strike lasted for two years, peaking with a day of action on 11th July 1977, in which an estimated 20,000 supporters joined the picket line. Facing a heavy police presence and right-wing pressure, the union leadership were forced to withdraw their support, and the strikers were subsequently defeated. However, their strike was a game-changer in the struggle against racism. 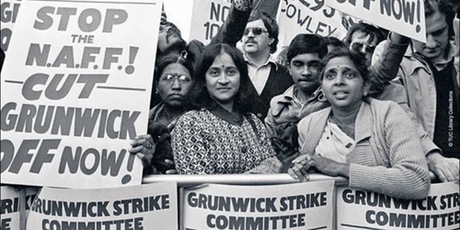 Grunwick strike became one of the greatest shows of black, white and Asian solidarity on the picket line that Britain has ever seen. The company employed 440 people, 80% of whom were Asian. The strike began after bosses dismissed Devshi Bhudia for working too slowly. Three others walked out in solidarity. She and her son Sunil joined four workers picketing outside after being fired. By the end of the week, 170 workers were out the door. These Asians were facing then what the East Europeans are facing today in Brexit Britain. Workers took on the violence meted out on behalf of their boss George Ward, and the government colluded to undermine solidarity. The cops were on the bosses’ side, regularly attacking the picket line and arresting strikers. They punched, kicked and dragged pickets across the road by their hair. The inability or unwillingness of the trade union leaders to offer real solidarity was astonishing. TUC general secretary Len Murray told the strikers, “We are not just behind you, we are up there with you all the way.” But his words were never turned into action. The Trade Union Congress (TUC) and the government panicked. The solidarity shown by workers was not matched by the union leaders, who called a halt to the mass pickets after the government commissioned an inquiry. Jayaben and others did a picket outside the TUC building as well to show that they were now at loggerheads with the TUC leadership and they felt betrayed or sold down the river. The strikers fought on bravely, before finally admitting defeat on 14 July 1978. Their action had lasted 670 days. The consequence of the demise of the Grunwick strike was it led to the wider demise of the trade union movement. The feeling among many Asian workers that white workers were irredeemably racist took a major blow. It challenged stereotypes, changed the face of trade unions and inspired a generation of people to stand up against injustice. Jayaben, who passed away in 2010, will remain an iconic figure in the labour movement history of Asian workers. Her movement changed the image of trade unionism forever. It was the prerogative of the white men till Grunwick happened. To celebrate and commemorate the strike, ‘We are the Lions’ is having an exhibition at the Willesden Library, showcasing unseen photographs, banners, posters, soundtracks and first-hand stories of the workers. The exhibition is a different slice of Gujarati history in the UK. This comprehensive exhibition about the strike was researched and curated by Poulomi Desai. The idea for the exhibition was conceptualised almost a year ago by Sujata Arora, chairwoman of the Grunwick Organising Group and a Willesden resident for many years. Sujata approached the council and the Brent Museum which then took it forward. At a private viewing of the exhibition last week, a few of the strikers and demonstrators gathered for a reunion of sorts, reminiscing the two years they fought for justice. 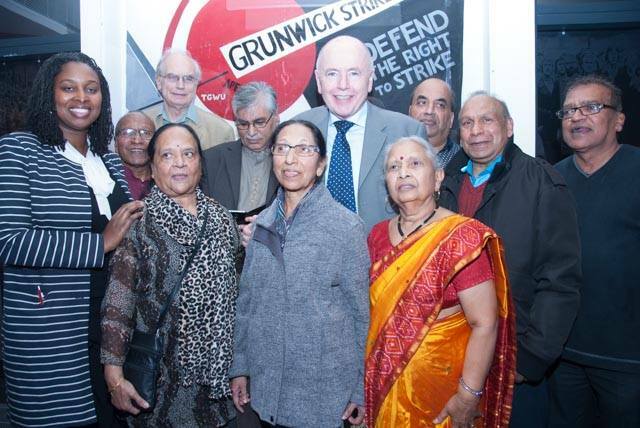 Among the strikers who attended the evening was the Secretary of the Grunwick Strike Committee, Mahmood Ahmad. ‘We are the Lions’ exhibition runs from 19 October 2016 to 26 March 2017 at The Library, Willesden Green, 95 High Road, Willesden, London, NW10 2SF. Visitors to the exhibition can enter free of charge from 9am-8pm on weekdays and between 10am-5pm on weekends. On 2nd November, the Khalili Lecture Theatre in SOAS will host a film screening called The Great Grunwick Strike 1976-78 followed by a panel discussion. The screening will take place from 7-9:30pm.